C'mon Tenkar! Don't cha know Hitler games are all the rage? That game is actually a legit game, made my one of the guys from Cards Against Humanity plus some other people. I worked PAX Prime for CAH, and they were set up in their pavilion giving demos. Really hilarious guys and SO NOT Nazis. The game is a blast. Hitler is very popular in America right now -- he is gonna be huge, one might say. 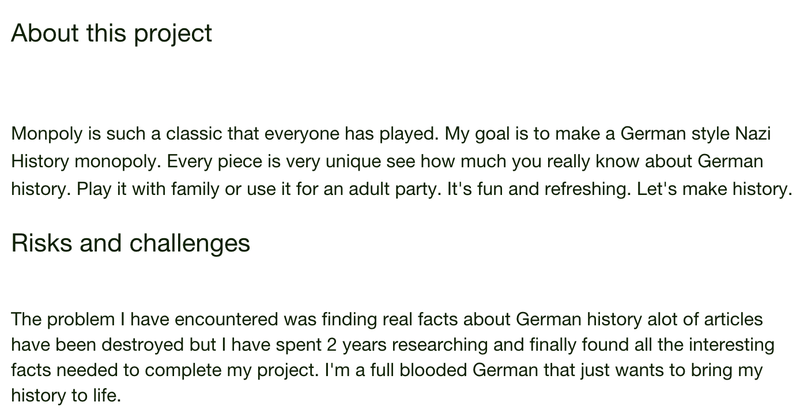 Kickstarter: Destroying what remains of my faith in humanity a piece at a time. 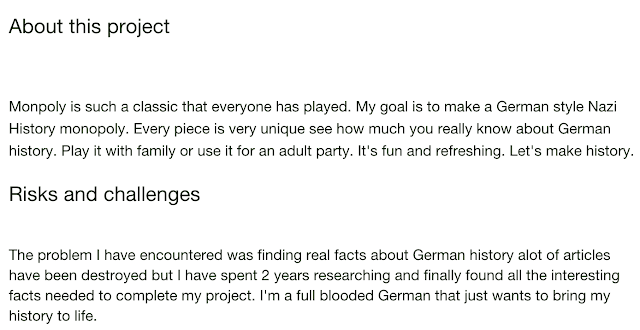 I reported this to Kickstarter on Friday. They are definitely aware it exists and claim they've vetted it and that it's legit. Here's a screencap of the email exchange. Go directly to Auschwitz, do not pass Gehen!, do not collect 200 Reichsmarks. When in Auschwitz, roll a die. On a 1, you escape. On any other result, you meet an unspeakable fate and are out of the game. All your properties and money go back to the banker, as if you were never in the game. Nobody is even to speak of you again. Nobody is "Just Visiting" Auschwitz. It is instead "A place in otherwise lovely Oberschlesien with nothing to see." Hey, Card Against Humanity has an audience....so can Hitler Monopoly. Read that background on the creator...Sounds legit!!!! Every thing that mentions Hitler/Nazis is AFAIK only illegal in Germany itself. Glad you guys weren't around when Hogan's Heroes was on. That "see full bio" part was pretty sad. If that's her story (and writing style) this will disappear on its own and hopefully she'll move on to something happier and healthier with her life. I am working on a WWII special forces (OSS, SOE, Jedburghs, etc.) game right now using the Swords & Wizardry rules titled WWII: Operation WhiteBox. Maybe I should make it anime and commission her for the art. 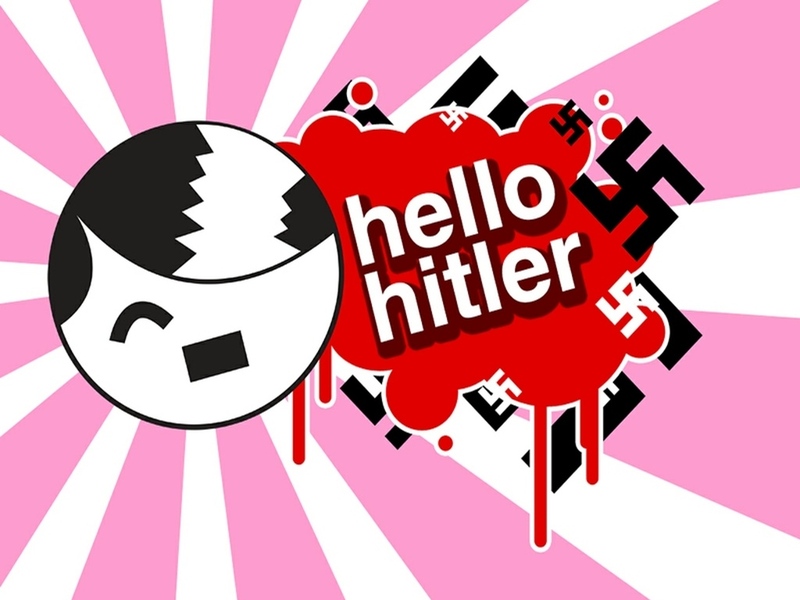 Happy Happy Hitler Time! So so Fun! Also, it took her 2 years to find facts on Hitler???? Where's a Morpheus meme that says "what if I told you that Germany has thousands of years of history?" when you need one?